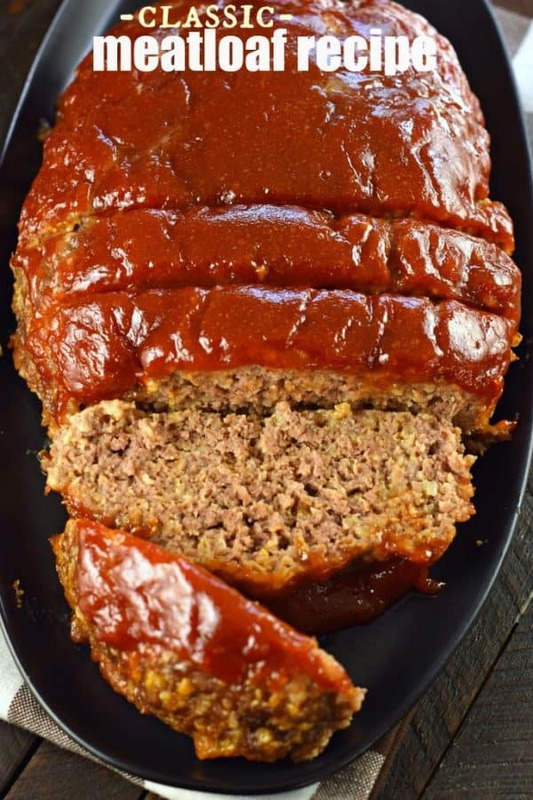 Tender, flavorful Classic Meatloaf recipe with a sweet and tangy bbq glaze. 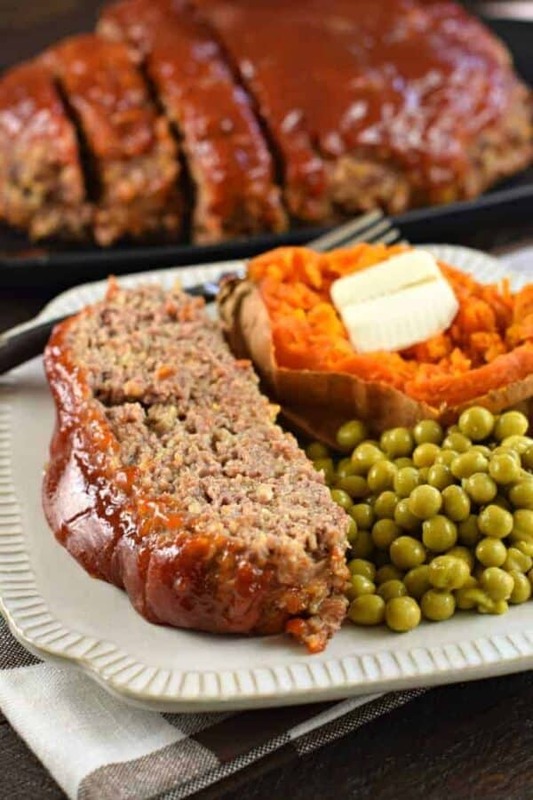 This Perfect Meatloaf is better than you remember, give it a try tonight! Growing up as a child of the 70’s, meatloaf was a staple on our family dinner table. I grew up eating this dinner, and to this day I still serve this classic meal to my family. Only, now I’ve changed up the flavor. Or I should say, I’ve added MORE flavor. I’ve taken the traditional meat loaf recipe of childhood and added a tangy glaze of homemade bbq sauce. It’s so good! When you hear people talk about mom’s meatloaf, this is why. 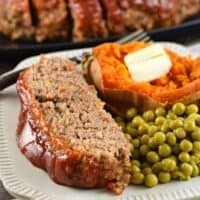 Put away all your misconceptions about what makes a great meatloaf, and give this delicious dinner a try! First, start with a lean ground beef. Some people will choose the cheapest ground beef on the market, and then wonder why they are left with a greasy meatloaf. 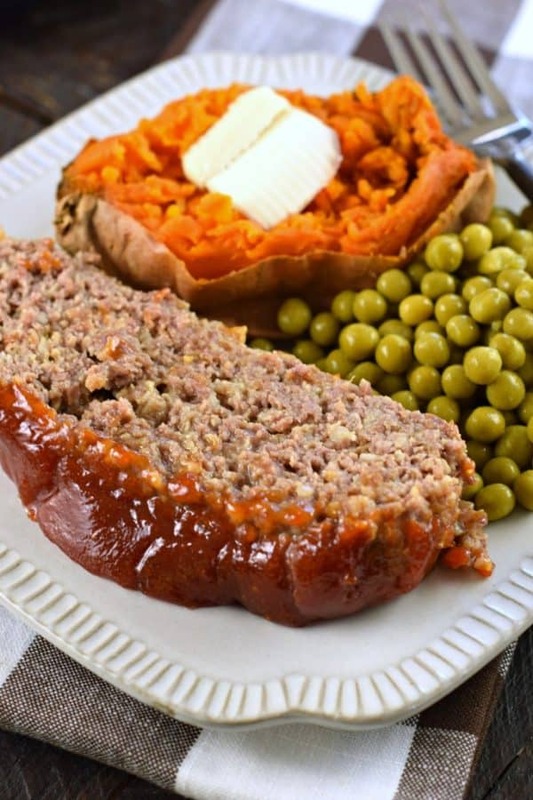 Opting for a lean ground beef creates a delicious, tender meatloaf. Combine your lean ground beef (90% or more) in a bowl with minced onion, garlic powder, quick cook oats, cheddar cheese, milk, eggs, salt and pepper. Adding the milk and cheese helps create a MOIST meatloaf, that will slice perfectly. Mix by hand or with a wooden spoon until combined. Line a large baking sheet or shallow baking pan (make sure it has at least a 1″ side to collect any moisture or glaze) with aluminum foil. Shape your meat mixture into a loaf. Some people will use an actual loaf pan or bread pan, but I prefer the way it cooks on a baking sheet. In a small bowl, whisk together 1/2 cup ketchup, light brown sugar, and yellow mustard. Spoon glaze over the top of your meatloaf. Bake in a preheated oven for about 55 minutes. Serve hot and enjoy! I know it’s not the holidays, but we still love making this Sweet Potato Casserole year round! 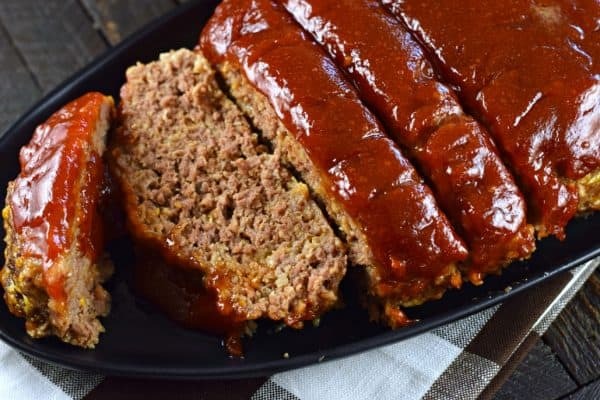 It’s sweet and delicious, and goes great with this BBQ meatloaf recipe! If you’re going to serve the perfect meatloaf you should also serve the The Best Mac and Cheese. This homemade macaroni and cheese recipe is one of the dishes my kids request on a weekly basis. I’ll change it up sometimes and serve this Gouda Bacon Macaroni and Cheese too. My mother in law makes the creamiest mashed potatoes. nobody will know Jill’s Cheating Potatoes come from a box! Looking for bread? These No Knead Garlic Parmesan Dinner Rolls will please the whole family! You can also try this Cheesy Onion Beer Bread. One bowl and easy to make too! Short on time? These Puff Pastry Bread Sticks are so easy and tasty! This Authentic Swedish Meatballs recipe is delicious enough for a weeknight meal, and impressive enough for guests! You’ll love the creamy sauce and the sides of cucumbers and lingonberries! These Sausage Stuffed Shells are the perfect freezer meal idea! They are also a great dinner to bring to family and friends! In case it’s familiar to you, I’ve made this Classic Meatloaf recipe in the past. You’ll remember it from a few Halloweens ago when I made these Bloody Rats and Bones. I used today’s bbq meatloaf recipe to create 12 individual servings. I served it up with an easy garlic bread (bones) idea! 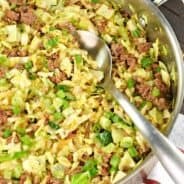 Combine your lean ground beef (90% or more) in a bowl with minced onion, garlic powder, quick cook oats, cheddar cheese, milk, eggs, salt and pepper. Mix by hand or with a wooden spoon until combined. Line a large baking sheet or shallow baking pan (make sure it has at least a 1" side to collect any moisture or glaze) with aluminum foil. Shape your meat mixture into a loaf. 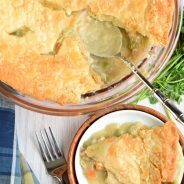 Love the tangy top on this recipe! Have to say…I always use oatmeal instead of breadcrumbs and it tastes so good! Yummy recipe! Thanks for the inspiration on dinner! 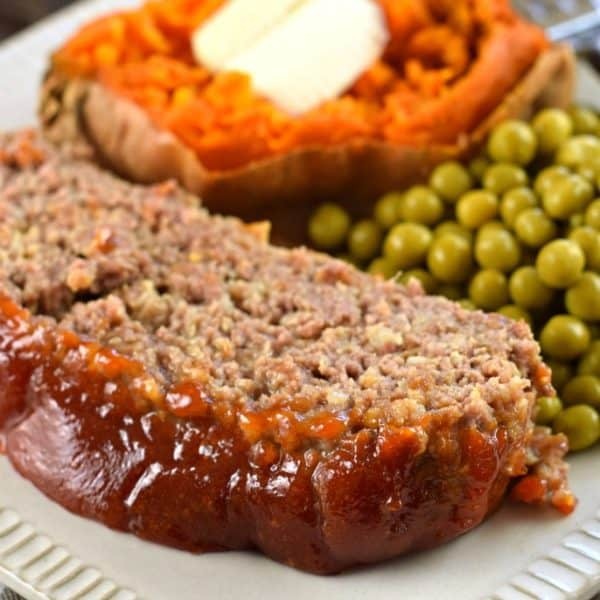 Meatloaf is a family favorite at this time of year! It’s perfect for cold nights. I love this recipe! I am loving everything about this!!! ESP that BBQ sauce. Sounds wonderful. This is such a family favorite! So much flavor and everyone’s guaranteed to clean their plates! Everyone needs this classic recipe in their weekly meal plz because it’s ultimate comfort food! This meatloaf is so tender and full of flavor. Definitely not the meatloaf of my childhood. 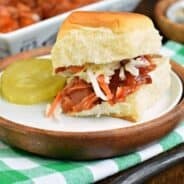 The bbq sauce is a wonderful addition – love it! I grew up eating meatloaf too, and it’s still one of my favorite comfort foods. The tangy bbq sauce makes this version taste so good!! Yes, it would work, but it definitely changes the flavor! How will this taste without the bbq topping? I prefer gravy (savory) over sweetness. It sounds delicious though. We loved this meatloaf! The glaze was just incredible too. We will definitely be having this meatloaf for dinner again! This is certainly not your average dry and boring meatloaf! This is delicious!